The Nabis were a group of precocious young artists whose close relationship started in school and later on Denis, Bonnard and Vuillard shared an apartment and remained life-long friends. This painting by Pierre Bonnard is a multi-figure composition, that fits Denis' description of a flat surface covered in a successful combination of colors, surface pattern and emotion with a nature-based subject matter. It is the scene of a croquet game taking place in real time with identifiable figures from his own life- his father, brother-in-law, and sister watching their cousin standing, to make her next shot. There were many peasant paintings with the title Twilight and in this case it is supposed to be evocative. It may be emphasizing the paintings melancholic undertones of Bonnard's father, getting old and coming to the twilight of his life. Pierre Bonnard, like the other Nabis, respected Gauguin and mostly admired his use of color. 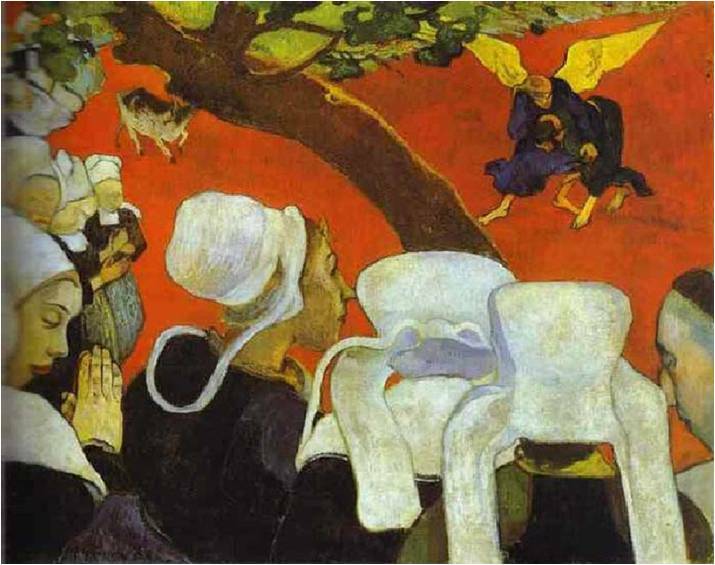 In Twilight, he was looking to Gauguin's Vision after the Sermon, but took his image out of any kind of religious context. Both paintings are structurally very similar. In the foreground of Vision after the Sermon, Gauguin has the Breton women in the actual reality, and people from Bonnard's life are playing croquet in the foreground of the Twilight. The upper part of both the paintings are devoted to the realm of the imagination- in Twilight, the dancing women who could be from any time, any place and in Vision after the Sermon, the apparition of the biblical story. 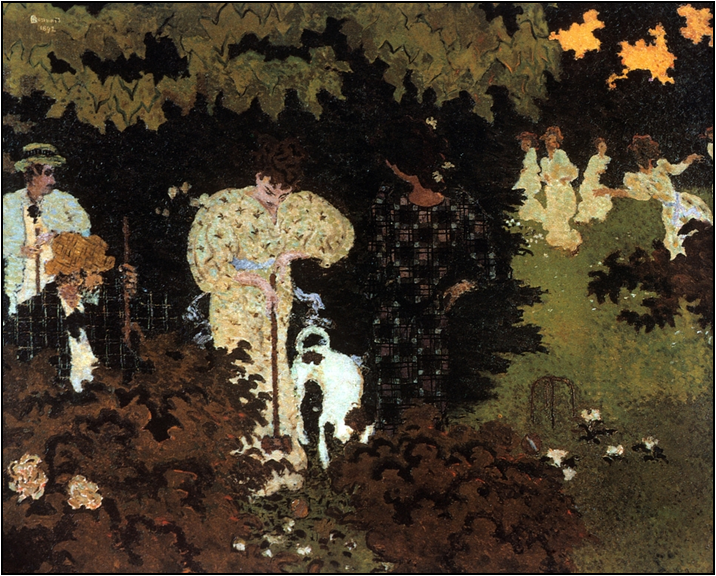 In Bonnard's canvas the figures stand shrouded in vegetation and half light, the surface of the painting, lush greens separated with linear patterns and especially the pattern of the dog in the middle, is a thick tapestry of design. Similar to Gauguin each area of color and pattern are separate. The soft, dusky light that permeates Twilight, is actually due to design than nature, we see the women dancing under carefully shaped forms of yellow and green on the upper right of the canvas. Bonnard painted Twilight on the grounds of his beloved family home. He used this country home in other paintings as well because he felt it embodied the ideal family harmony. He is known for his built up surfaces of broad and short strokes in colors of close values and narrative compositions of interiors and gardens inhabited with family and friends.